May have a pop up here! Kenneth, thanks much for the chart graphix.. with regard to PM's you really don't need a lot of explanation for today's actions after looking at what you put forth, here~! Again.. high marks.. clarity and timeliness~! I wonder if this bad boy will exceed the level you have Ed. With all the love and pink unicorns between the 2 Korean leaders last night, this may keep going to the 92. 9 level??? Dollar stronger, PM's up, oil is strong, the two Korea's are having a love fest Macron and Trump having a lovey dovey and Trump is shaking Merkle's hand, Trump is talking tough to Iran, and the first state dinner hosted by Trump's had fake jambalaya to go along with fake news and all the while, of little notice the first reading on GDP was up a whopping 2.3%. An interesting week! DXY continues to gain apparent strength, but remember the comparison is against equally flawed fiat currencies, all heading south. That just makes the dollar the least dirty shirt in the laundry. The fact that PM's and PM stocks while down a bit, have not tanked is positive for the sector in my opinion. Commodities in general are doing well and WTI in particular is around $70. I doubt seriously that the dollars purchasing power is increasing and if it is, it is minimal and temporary. 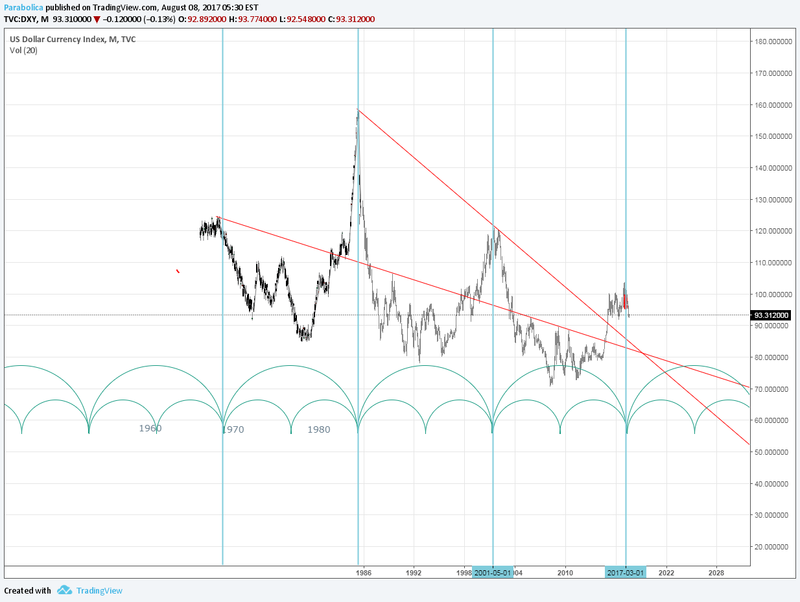 The link is to charts of dollar index currencies, not sure if it will print in the post as chart. Uh oh. more pain for metals. In support of Snoops chart in reply 85, I too think DXY is showing signs of cresting. The three short blue arrows point to highs forming a triple top and this formation is below recent highs (making lower highs argument). MACD curves are near recent highs and the histogram is pinching for the last three weeks. RSI is in over bought territory and generally sloping down for May. I doubt the recent run up lasts much if any longer. A week ago gold and silver plunged relatively speaking, but this occurred concurrent with a rise in the dollar and bump in interest rates. This leads me to think the recent moves are not the capitulation needed to kick off a spectacular secular run up in PM's. There may be more 'basing' before we get the capitulation. With many traders and investors expecting big moves up in PM's and PM stocks, volatility expectations are high which is reflected in options premiums. Writing them continues to provide decent returns. I noticed the same thing. Next month should give us a move up in the PM's. With the elections and all the other crap as to politics, this may help in the months to come..